The Express object-oriented language is universal and is used to describe the static structures and their properties using entities, attributes, types, and their relationships. EXPRESS-G is an addition to the EXPRESS standard and is used for graphical modeling notation of informational models. The data model at the use of EXPRESS-G graphical representation has a more simple and more understandable structure. 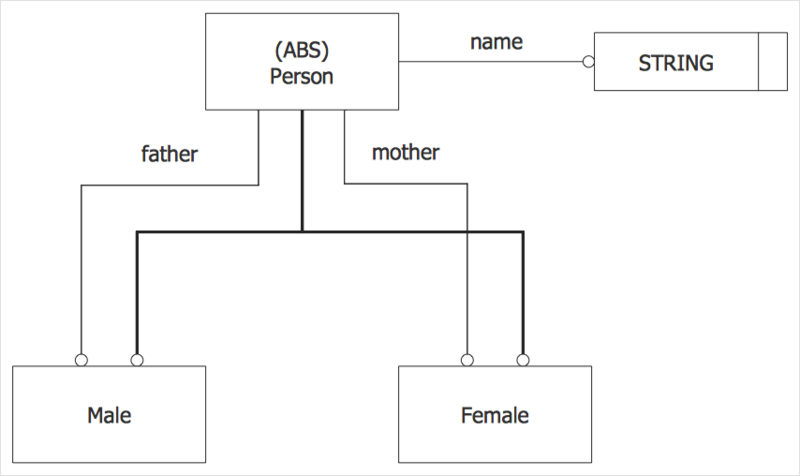 This article shows how to build EXPRESS-G on the example of a data model that illustrates the family schema. This model includes the supertype entity Person with two subtypes Male and Female. The entity Person is declared as abstract (ABS), so only occurrences of Male and Female subtypes can exist. Each occurrence of a person obligatory has the name attribute and optional mother and father attributes. All notation shapes used in this EXPRESS-G diagram are commonly used in the charts of this type, thus are easily recognizable for readers. Reveal the EXPRESS-G Diagrams in the Solutions panel. Open the EXPRESS-G library. Choose connection tool to depict the logical relationships in the model. In our example, we used the Smart connector . Connectors' attributes: type, thickness, color and endpoint type are specified using the Format panel. Result: This example, created using ConceptDraw DIAGRAM, supported by EXPRESS-G Diagrams Solution represents a sample family structure.